It might be inaccurate to say the release of Bela Tarr’s “The Turin Horse” marks the end the Hungarian director’s career. Rather, Tarr has reached the conclusion of one stage and the beginning of another. With the release of his tenth feature, Tarr has made it clear that he’s through with making movies; now, he wants to focus his energy on teaching others how to make them. Anyone familiar with Tarr’s work since the early 1980s, from the revisionist noir “Damnation” to the legendary seven-plus hour small-town chronicle “Satantango” will feel right at home with “The Turin Horse,” which bears all the trademarks of his style: Pensive camerawork, stark black-and-white photography and experimental tangents from any semblance of a straightforward narrative. As the story of a man, his daughter and their trusty horse in a dreary countryside that might represent the end of existence, the movie certainly appears to indicate the climax of Tarr’s career–even he wouldn’t put in those terms. In a phone conversation from Hungary, Tarr–with his typical deadpan delivery–explained why he chose “The Turin Horse” as his final project, reflected on the evolution of his distinctive career and hinted at what might come next. While your work stretches across over 30 years, you’ve only made a handful of features, and you remain a critical darling. Why stop making movies when you’re still at the top of your game? You’re right. A filmmaker is a nice bourgeois job. But I really don’t want to do it. I’m not a real filmmaker. I’ve always been in it for the people and just wanted to say something about their lives. During these 34 years of filmmaking, I’ve said everything I want to say. I can repeat it, I can do a hundred things, but I really don’t want to bore you. I really don’t want to copy my films. That’s all. Do you remember when you first decided you wanted to stop? I think it was 2008, when I was doing an interview with Cahiers du Cinema, and I had a feeling that I could only do one more film, “The Turin Horse,” and then the shop is closed. So while you were shooting “The Turin Horse,” you were thinking of it as a final film? Yes. Everybody knew. The whole crew knew this would be last. Of course, they wanted to convince me to do more and more, but I can’t. This is my personal decision. I can’t say more than I’ve already said about it. At the beginning of my career, I had a lot of social anger. I just wanted to tell you how fucked up the society is. This was the beginning. Afterwards, I began to understand that the problems were not only social; they are deeper. I thought they were only ontological. It’s so, so complicated, and when I understood more and more, when I went closer to the people… afterward, I could understand that the problems were not only ontological. They were cosmic. The whole fucked up world is over. That’s what I had to understand, and that’s why the style has moved. Once I went down, I kept going down. The style became more and more downward, by the end, becoming more simple, very pure. That’s what was interesting for me, to discover something step by step. That would explain your move beyond exclusive focus on characters. “Family Nest” is almost entirely comprised of close-ups, but your later films put a greater emphasis on the surrounding environment. But if you watch them all together, you can see that this is the same man’s work. You can see the long monologues in “Family Nest,” they’re already there. 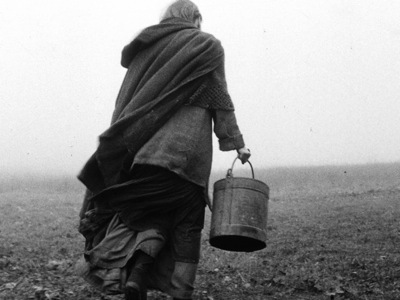 The opening shot of “The Turin Horse” has been discussed by many critics at great length. The camera explores the horse and its rider from multiple perspectives, racing alongside with powerful momentum. How did you conceive of this introductory sequence? You have to understand, when you’re doing a movie, you have to introduce everything: In this case, the horse, the driver. That’s all, you know? But at the same time, this is a movie based on an apocryphal story about Nietzsche feeling sympathy for a beaten horse. It’s steeped in repetitive cycles and sparse dialogue. It begs for interpretation, so why not take a stab at it? Don’t be too sophisticated. Just listen to your heart and trust your eyes. That’s enough. When I’m doing a film, I know the whole thing before I shoot it. Really. I have a very strong vision for all my movies. I know very clearly how and what I’ll do. In “Damnation,” a character says that “all stories are disintegration.” “The Turin Horse” seems like the ultimate realization of that. I don’t care about stories. I never did. Every story is the same. We have no new stories. We’re just repeating the same ones. I really don’t think, when you do a movie that you have to think about the story. The film isn’t the story. It’s mostly picture, sound, a lot of emotions. The stories are just covering something. With “Damnation,” for example, if you’re a Hollywood studio professional, you could tell this story in 20 minutes. It’s simple. Why did I take so long? Because I didn’t want to show you the story. I wanted to show this man’s life. You’re not big on coaching actors. When I do a scene, I create real situations and I know how they will react. You have to know how they will react because they have to be in the situation. You can get real emotions — anger, joy — from their eyes. Yes, I’m getting mad about it. I’ve answered it a thousand times. The long take can be the same as the short take. The difference is that you’re editing in the camera. You’re putting the close up and the wide shot together. You have a special tension between the actors and the camera. That’s why I like it. Digital cameras allow for longer takes. Did you ever consider shooting digital? No, I prefer 35mm. Celluloid, for me, is the thing. Do you think there are good reasons for other filmmakers to shoot their projects digitally? Yes, of course, but they should not pretend this is a movie. They can say this is a new technology. And the new technology has to have a new language. That’s what I prefer, when you make a new language. Do not say this is a film. Video has to find a new language because it’s a new technology. How do you feel about people watching your films on different platforms other than a large screen? I hate it. For example, I heard somebody watched “Satantango” on a mobile phone. That hurts me. It was planned and shot for the big screen. Your films are quiet, almost meditative experiences. Does it feel that way on the set? No! None of it is meditational. You have to hold everything in your hands. Filmmaking is horrible work and you’re always fighting with the weather, the time, the money situation. When you’re on the set, you have no time for any intellectual effort. You have to just go ahead. When you know what you want, you never stop before you get what you want. Do you bring these sort of lessons to the classroom? I’m building up a film school in Croatia as we speak. When I’m teaching, my students, young people, are shooting their own movies. I just try to help them develop something inside themselves that they may not have enough courage to realize, or they don’t know how to explain themselves. I just push them, push them, push them to find their own language. I never teach them my film language because every filmmaker has a different language, a different culture, a different background, a different history, a different budget. You cannot compare these things. But I can push them to be themselves and create something personal. I’ll help them if they have doubts. “The Turin Horse” opens in limited release this Friday.